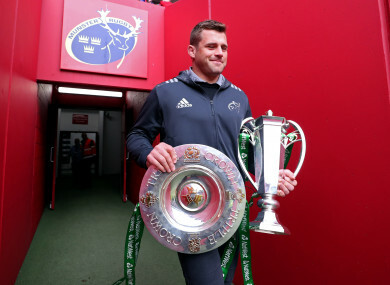 CJ STANDER IS coming to the end of his sixth season with Munster and, while he has tasted magnificent success with Ireland, he is still waiting for his first silverware at provincial level. Racing 92 ended Munster’s European dream for another season, so Stander knows that a slip-up against Edinburgh on Saturday will seal another fruitless campaign. The number 8 will be wary of an in-form Edinburgh side in Saturday’s Pro14 quarter-final at Thomond Park with Richard Cockerill’s men coming into the clash on the back of eight wins in their last nine games in the competition. “They are a team that work hard every weekend for each other. A lot of people really didn’t see them coming in games, and they surprised them. They work hard for each other, have a big work-rate and the team stick together. The glory of the Grand Slam has given Stander further appetite for success at Munster, not least given all the disappointment in recent years at the business end of the league and Champions Cup. Look, it is a thing we work for every year. It is tough to get into those semis again and a final and not get anything. Especially, personally, if you have won something you want something again. He said the review of the Racing 92 loss was painful but they have to put that defeat behind them and focus on trying to win the league for the first time since 2011. “Those reviews are always the toughest ones because a lot of people are honest. That’s really what you need in this job – you need honesty and coaches are always honest with us. “We see what we did wrong. You can’t start like that at all. 24-3 down in the first half, you’re never going to come back. We did it against Leinster in Thomond Park in the PRO14 and we were disappointed again. “It’s like an addiction. You need to put your hand up and say ‘I wasn’t good enough and I didn’t do this good enough.’ And deal with it yourself first and then you can look at other people in the process. Email “Taste of silverware intensifies trophy chase with Munster, says CJ Stander”. Feedback on “Taste of silverware intensifies trophy chase with Munster, says CJ Stander”.